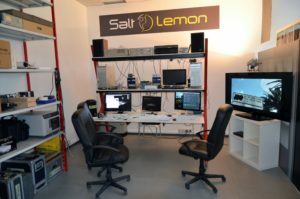 Salt & Lemon was founded in 2009 by people with a strong IT background, experienced and passionate about cinema, images and technologies. Since the first year, the company has invested in digital technologies for film production, offering, among the first in Italy, the 4k professional shooting format and maturing several experiences in the post-production industry. In 2010, the first UAVs with on-board cameras appeared in the United States. Salt & Lemon has came to the conclusion that the remote control vehicles (drones) was a field of interesting prospects and began acquiring the skills needed to design and build its first remote controlled drone. Today, after years of experimentation, many drones designed, built and customized, the provision of services for major national productions and the extension to other sectors such as Agriculture, Industry and Local Administrations, Salt & Lemon is one of the most qualified companies in providing aerial services through drones. At the moment we are cooperating with several academic and research bodies such as Ente nazionale Risi (National Authority for rice cultivation guidelines) the Agriculture department of Turin and Bari University for advanced Precision Farming applications and Politecnico di Torino n the area of aerial photogrammetry. Moreover we are establishing a network of partners (either UAV operator or professionals), called SALTLEMON.SHARE in various italian regions. In the training field we have a partnership with SAPR Italia and other companies for the training of pilots and technical personnel. Salt & Lemon was among the first Italian companies to receive the status of “recognized operator” from the ENAC (Italian Authority for Civil Flight) and is enabled to operate in both critical and non-critical contexts.